This item is a Van Leeuwenhoek Microscope. The microscope located in the cabinet is a replica of van Leeuwenhoek’s design, made by the Museum Boerhaave in Leiden in 2011. The Van Leeuwenhoek is a prime example of a simple microscope. Much like the Midgard Pocket Microscope shown previously on our tour, the van Leeuwenhoek uses only one magnifying lens, rather than a system of lenses and eyepieces as we see in more modern and complex devices. While simple microscopes cannot achieve higher optical magnifications, this can be somewhat combated by using smaller lenses. The smaller the lens, the smaller the radius of curvature and therefore the smaller the focal length. This allows for more magnification and so produces a larger virtual image. This replica model achieves a magnification of around 80x, and one of Leeuwenhoek’s surviving originals reaches a magnification of 266x, with a resolution of one micron. The replica Van Leeuwenhoek in the case uses the lens from a phone camera, with a shape not dissimilar to the lenses made by Leeuwenhoek. The Van Leeuwenhoek is deceptively minimal in its design. The single spherical lens is mounted in the small aperture of the brass body of the instrument. The specimen being examined is then mounted on the sharp point that sits in front of the lens. 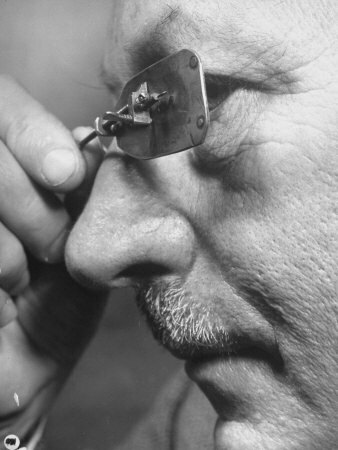 The instrument was then held close to the eye, and the position and focus of the specimen could then be adjusted by turning a small series of screws. While the microscope provided good magnification, its use required good lighting and a great deal of patience. Antoni van Leeuwenhoek (1632-1723) never undertook any formal science education. His interest in microscopy began when he encountered simple magnifying glasses during his apprenticeship with a cloth merchant. 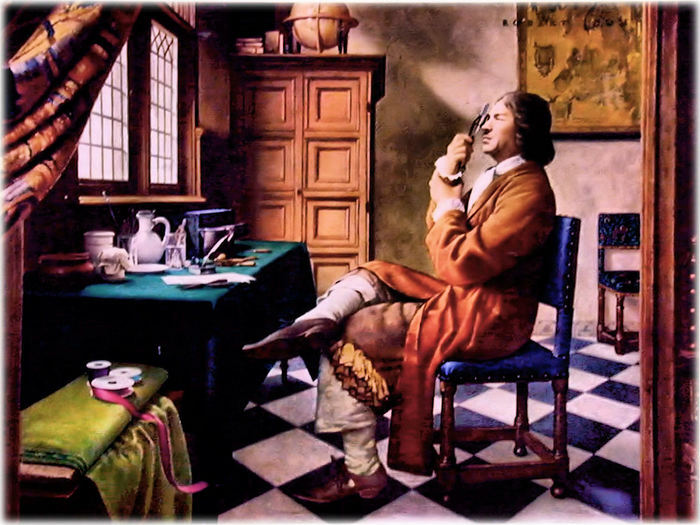 In 1654, Leeuwenhoek used his knowledge of glass making to create the small glass spheres which he turned into his simple, handheld microscopes. The glass spheres were created from small rods of soda lime glass that were heated and pulled like toffee. The glass spheres were very small and of a very high quality. Even though Leeuwenhoek had no knowledge of scientific language and never wrote any formal papers, his observations of microorganisms earned him the title ‘the Father of Microbiology’. Among his discoveries were the existence of bacteria, blood cells and sperm cells. His discoveries were documented in the form of letters that he wrote to the Royal Society over a period of fifty years and which are still available today.